Astronomers make up amazing acronyms for their projects. Astronomers have somewhat of a reputation for twisting the names of their projects and collaborations to get just the right acronym. The results are often clever, funny and awesome. This trend toward tortured astronomy acronyms was on display at the 225th meeting of the American Astronomical Society (AAS), which took place last week in Seattle. Among my favorite acronyms this year were SLoWPoKES (which stands for Sloan Low-mass Wide Pairs of Kinematically Equivalent Stars), ASAS-SN (All-Sky Automated Survey for SuperNovae) and ANGST (ACS Nearby Galaxy Survey Treasury). "It's not an astronomy survey if you're not really reaching for the acronym," joked Emily Levesque, a Hubble Fellow at the University of Colorado, Boulder, in a plenary talk at the meeting. The acronym to which Levesque was referring was for the proposed Hubble survey ULYSSES, (Ultraviolet LibrarY of Spectra for Star-forming Environments). 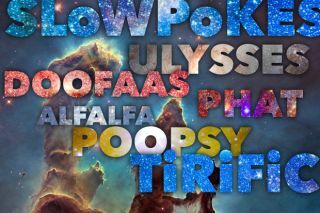 If you don't believe that odd acronyms are a trend in astronomy, check out this exhaustive list compiled by Glen Petitpas at the Harvard-Smithsonian Center for Astrophysics, which is aptly titled DOOFAAS (Dumb Or Overly Forced Astronomical Acronyms Site). Some highlights from that list include POOPSY, DONUT, and FLAMINGOS. One talk at the meeting contained two acronyms that made reference to characters from "The Lord of the Rings" book trilogy: SAURON (Spectroscopic Areal Unit for Research on Optical Nebulae), which is also the name of the villain in "The Lord of the Rings," and BaLROG (Bars in Low-Redshift Optical Galaxies), which is also a species of fiery demon from J.R.R. Tolkien's universe. While the standard rule of creating an acronym requires taking the first letter from each word, many astronomical groups bend this rule a bit, as in the case of the AGHAST survey, which stands for A Grism H-Alpha SpecTroscopic survey, or in the case of the computer program TiRiFiC (Tilted Ring FiTng Code). Sometimes acronyms have duplicate words, as in the case of ALFALFA: the Aricebo Legacy Fast ALFA Survey (ALFA stands for Aricebo L-band Feed Array). These clever and often humorous acronyms tend to belong to smaller experiments, surveys, collaborations and projects. Large projects tend to be more reserved when it comes to creative acronyms. For example, three of the biggest, most expensive telescopes currently operating or soon to begin operating include the JWST (James Webb Space Telescope), LSST (Large Synoptic Survey Telescope) and ALMA (Atacama Large Millimeter Array) — nothing adventurous there. Compare those with acronyms like VIDEO (VISTA Deep Extragalactic Observations), SMACK (a Superparticle-Method Algorithm for Collisions in Kuiper belts and debris disks), SMASH (Survey of MAgellanic Stellar History), NICER (Neutron star Interior Composition Explorer) and FIRE (Folded-port InFraRed Echellette). Alex Deich, who does work on the PHAT (Panchromatic Hubble Andromeda Treasury) survey, took his project acronym to the next level. Deich titled his poster "PHAT Youths," referring to his study of young stars in the PHAT data. The perception that astronomical acronyms are a bit silly was perhaps best displayed in a talk by @exoplaneteer (and posted to twitter by @shaka_lulu), in which he revealed this new acronym: YAITSITKLC, which stands for Yet Another Independent Transit Search In The Kepler Light Curves.